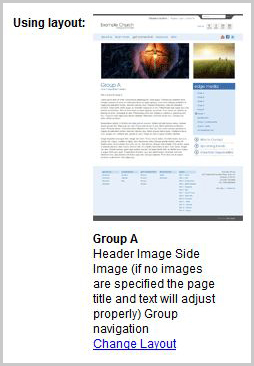 When you are working in the Page Editor screen, the current selected layout for your page will be indicated in the Settings panel on the right side. You will see a thumbnail preview of the layout, as well as a description. To change the layout for your page, click the "change layout" link in the Settings panel, and a list of all available layouts will be available in the pop-up window. Select the icon that represents the type of layout you desire, and click the "OK" button at the top of the window. For instance, you may want to choose a page layout that has images in the header or side area, or one that allows for quotes, etc.